Wrapping your favorite plug with bait has become the norm for successful salmon anglers. While it’s a great addition to any plug its time consuming and tedious. It’s no secret that running Flatfish, Maglips and other plugs are standard techniques when chasing salmon, but I often get asked what to wrap your plug with. Wraps aren’t made to last. In fact, oftentimes after catching a fish on a plug the bait wrap has deteriorated. Now you have to take the time to rewrap your plug, thus wasting valuable fishing time. In recent years I’ve tried to revolutionize the way I wrap plugs and come with a way to speed up the process of changing bait wraps quickly. Sardines have been standard in wrapping plugs. Meanwhile, I’ve played with multiple other baits that can entice even the toughest salmon. Tuna wraps easily like sardines, but what about wrapping sand shrimp, prawns and cured eggs? These baits don’t wrap as easily and tend to fall apart with the action of the plug. Nevertheless, I started tinkering with how to use different baits and speed up the way I attached baits to plugs. I discovered all baits can roll into a ball and be wrapped in spawn sack material and started making spawn sack balls of sardines, tuna, sand shrimp, prawns and eggs or any combo of these. I starting mixing these baits with cured eggs to enhance the scent, thus giving me two powerful scents on one bait. You get Pautzke Nectar juice in your plug now. The tricky part was figuring out how to attach to plug. Ironically, this became the easy part. When using plugs with treble hooks you simply slide you’re the plug ball onto the bottom point of the belly hook, which lines up with the center line of the plug, allowing it to swim straight and true. Plugs with a single siwash hook need slight altercation. I simply attach at plug connector to the belly eyelet of plug, then open the clip and slide the ball onto the clip, hanging it on the centerline of plug allowing your plug to swim properly. The coolest thing about this setup is how easy I can slide a new plug ball on keeping fresh bait on my plugs at all time without the hassle of rewrapping. The other thing I like is this system allows me to change the flavor easily if I am not getting bit. You can also have different bait than the other boats nearby. One my favorites is adding cured eggs to my favorite plug. How can you beat the best of both worlds? What we are accomplishing is two-fold. It helps me catch fish now – and later in the season – by adding scent to my Fire Brine, BorX O Fire and Fire Cure eggs and also adding egg scent to my bait. We’ve finally come up with a way to give salmon a plug that smells like cured eggs and cut bait. All of us have wanted to wrap plugs with eggs, but unfortunately, they’d fall off with the action of the plug. How are we doing this? As mentioned above, instead of wrapping my plugs I’m putting them in spawn sacks where I can hang them on my plugs and they wont fall off. All we are doing is grabbing a ball, snapping it on and releasing into the water. It’s an easy process we’ll cover below. When using sardines, tuna, sand shrimp or prawns cut them into desired sizes. The equation is simple: larger balls for larger plugs and smaller balls for smaller plugs. 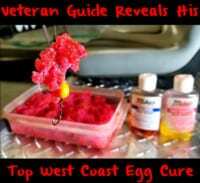 Take pieces of cut bait and drop them into a Ziploc of cured/curing eggs. This enhances the eggs by throwing bait chunks in overnight with the curing eggs. It adds the egg scent to my cut bait and the cut bait scent to the cured eggs (which will be used when I’m not running plugs). This now enables us to combine many of the best scents known to salmon anglers. After sitting in the egg cure overnight remove the cut bait and separate them into categories (herring, sardine, tuna, prawn, etc). 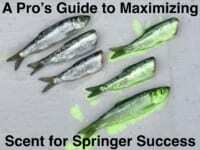 These cut baits will have their natural scent and egg scent. Take a square of spawn sack material, place bait into the middle, fold corners around bait and spin tightening the bait into a ball. Next, take stretchy thread and wrap around tightly to secure the ball. You are now done and ready to fish. Editor’s Note: Veteran guide Bob Kratzer has guided throughout the Northwest and in Alaska for decades. His revolutionary techniques have been featured in newspapers, magazines, on TV shows and radio shows. For more information on his trips please visit www.anglersguideservice.com.